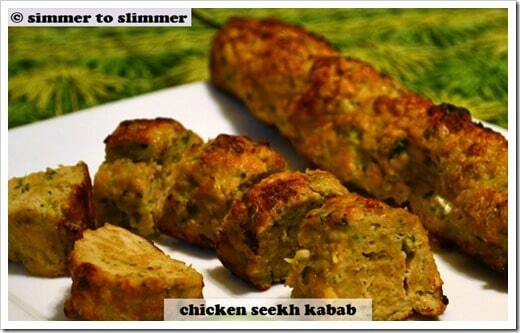 Chicken kababs make a nice accompaniment with rice/naan or can be a meal in itself. 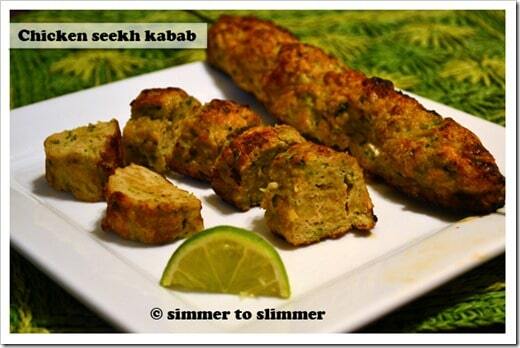 Squeeze lemon juice on the kababs before serving to give them a nice tang. Chicken seekh kabab is made of minced chicken mixed with spices and grilled on skewers typically inside a tandoor but an oven will do just fine. I had the best kababs in an Indian restaurant in Michigan and had tried once before to recreate it but couldn’t quite match the taste. I gave up on kabab’s till my BFF sent me this recipe she made for a potluck and she insisted I try it..Finally, after a year, I got around to making this and they came out so well that I almost wanted to kick myself for not trying it sooner. I made a few small changes to accommodate the audience at home who don’t like eggs so I didn’t use them for binding, instead, I used breadcrumbs. Serving size: 1/6 of a recipe (7.1 ounces). Grind all the ingredients into a smooth paste and mix it with the ground chicken. Add 1 egg or 1/2 cup breadcrumbs and butter/oil to the paste and mix well. Refrigerate the marinated chicken for about 2 hours (if possible). Note: I was in a hurry so I didn’t refrigerate the paste and it came out okay. Let it cook for about 10-15 minutes. When done broil for about 2 minutes till they turn brown. Serve with raw onion rings and lemon wedges. If you are having trouble with the chicken not adhering to the skewers do this – shape the chicken in the shape of the rod on the greased baking sheet and then insert the skewers through it and carefully place the sheet in the oven.